You might be thinking, "Wow, I ought to pick up a copy too!" – Well, don’t; there’s nothing interesting in there at all! In fact, just by the cover, this magazine could quite easily have been a copy from 12 months ago (apart from the ‘2009’ bit) and nothing inside the magazine is particularly thought provoking or innovative either. Just for this post’s sake we’re doing to ignore the ‘iPhone’ nonsense on the front-cover because I don’t see platform specific development as of a prime importance. I’m not normally one for making a big deal out of nothing (okay… that’s a lie) but this magazine and in fact, many recent publications (web and paper) scream 2007 at me. I don’t know how popular these ‘web design’ magazines are but I’m guessing they’re quite successful considering that most WH smith stores seem to stock them. ‘Web Designer‘ is another top magazine in the industry, but I have to say it’s even more disappointing than ‘net’; not just this month but generally, the ‘Web Designer’ seems to be nothing more than a beginners resource, at best, it may offer the average amateur something inspiring to read but nothing past that! You’ll have noticed the somewhat negative title of this post; pessimistic as it may seem, this is how I feel. I am proud to say that my skills have advanced leaps and bounds in the last year and I’m sure many people have had a similar experience but the collective web designer/developer consciousness seems to have stayed pretty still. Note that I’m not talking about the advance of any particular technology but rather the advance of our aggregate knowledge as web designers/developers. In many ways this industry is one of the most fast-moving of them all but in other ways watching this industry progress is like watching paint dry! I’m not trying to damage the impeccable reputation of the ‘net’ magazine but I feel that this month’s issue serves as a clear and obvious reminder of the sometimes stagnant state of certain portions of the web design industry. Fortunately the one thing that made me buy this issue did make for quite an interesting read (the ‘2009 awards’). Although I don’t agree with their decision on a few of the nominees I still feel that they got it mostly right. I am glad the BBC won the ‘Best redesign’ award – they definitely deserved it! One quirky award named the ‘Standards Champion’ went to the notorious Jeffrey Zeldman, who, to me, comes across as the beaten horse of web standards. All I ever see of him are those sinister-looking profile shots and the odd controversial blog post. A-List-Apart, one of his publications, does make for good reading sometimes but normally the articles seem a tad boring – probably because I’m only 18 and can’t be arsed! Not to mention the publication’s headlines seem totally incomprehensible when listed in my RSS reader! So, obviously, I am a little bothered by what I see as a lack of progression. I think something needs to change, and soon, otherwise next December we won’t have progressed anymore! One last thing, who the hell sends ‘reader questions’ into the mentioned magazines, don’t these idiots know how to use Google, IRC or an online forum!? One question was asking how to achieve transparency in IE; something which apparently is not well known to ‘web professionals’, seriously, what is happening!? 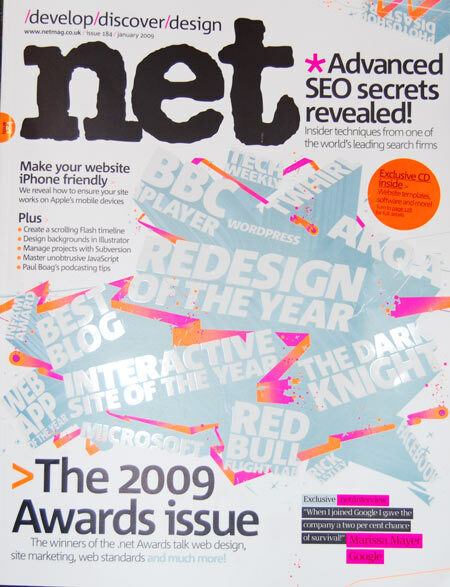 I used to live by Net magazine and Web Designer, I haven’t picked up a copy for well over two years now. I don’t think I ever read one of them properly in any case. There is so much more on offer with just a light search of the web and, if your industrious enough, picking apart some of the better designed websites out there. Reverse engineering is my hobby of choice at the moment. Glad someone else has notice the obvious lack of motivation from these so called market leading publications. From what I can tell they seem to make more of an effort on their websites but don’t hold me to that. A provocative post James, but I disagree somewhat with some of your points. The iPhone-specific design/development bandwagon is somewhat curious. I remember the web standards movement preaching an attitude that didn’t focus on a particular browser (and we all know which one they were talking about), but develop sites that supported standards and adopt an approach that supported progressive enhancement. We’re now seeing quite a few articles on iPhone development – I believe this is something of a turnaround. Perhaps it’s because it’s an apple product, perhaps it’s because a lot of these ‘cool’ designers/developers have an iPhone. Perhaps it’s because the iPhone is a revolutionary mobile device and it represents the future of mobile web content. I thought the iPhone article was marginally interesting, but it could have covered all the material in a quarter of the size. I don’t know if you read the magazine a couple of years ago, but its general quality has gone through the roof, believe me. My biggest point however is that there are a lot of web developers and designers out there who do not follow best practices. I’ve worked with so called ‘professionals’ who still use tables for layout and spacer GIFs, and I bet they’re still doing this in 2008. I take your point about the readers letters, but written correspondence is a common feature of magazines, and although most of the letters aren’t worth reading, there is the occasional point of interest. .NET is certainly the best web development/design magazine out there, but there isn’t a great amount of competition. If you’ve got suggestions for improvements, why not contact .NET’s editor, Dan Oliver on Twitter: @danoliver. Sometimes I flick through Net magazine when I’m in WHSmith’s. I never buy it though. Too expensive when all the information in it is already on the web or I know the stuff already. Having said that Net magazine is probably the best web design magazine out there but that’s only because there is no competition. If you’re a web design beginner stay away from it and use the real Net. Thomas S, I wouldn’t necessarily say a “lack of motivation” is to blame; the publication itself is very respectable and sometimes I feel like they’ve put a little more effort into the aesthetics of the magazine than the quality of the articles. The December issue had a featured interview with Marissa Mayer, Google’s vice president of products and UE. Half the space taken up by the interview were of photos of her, she may be good looking but a whole page just for a shot of her, what are they playing at, where’s the content? What I’m trying to get at is that the motivation of the .net team is shown clearly through the magazine’s excellent design and layout but it seems they consider that more important than delivering correct, interesting and most importantly, NEW content. Shane, Thanks for your comment. Admittedly I haven’t been reading .Net for that long so you probably have a little more perspective when it comes to analysing the success of such a publication. I’m not saying that they’re not a good publication, I just think their content is not always that great… obviously there are exceptions, some articles are quite enlightening but when it comes to the technical stuff I find them to be a little below par. To me, it seems like they’re very good at reporting the news and documenting industry trends – this is where the magazine really shines. I unsubscribed from .net for this same reason James. The main thing about it is that you can get everything from the magazine just by being an online person – involved with reading all the usual blogs etc. Essentially as you say, nothing of interest. Mags are OK, but so long as the ‘design’ doesn’t distract from the content.. and in the case of Mags like .net, it’s all design and nothing much else. Mostly the only reason I bought the .NET mag was to look at pretty graphics on the train home. I’ve decided not to waste my money on it as well. I used to love their podcast until they made it a video tutorial. I bought it twice and I found that they recycle the articles which are more than one year old. I found nothing interesting with this magazine. Very diappointing.